As the Russian Embassy in Delhi marks the birth centennial of one of India’s greatest diplomats, Dadan Uphadhyay talks about his encounters with the two-time ambassador to Russia. It is indeed gratifying that Russia is formally celebrating the birth centenary of late Triloki Nath Kaul, one of the few “famously towering diplomats” that India ever produced, at the initiative of the Russian ambassador to New Delhi, Alexander Kadakin. 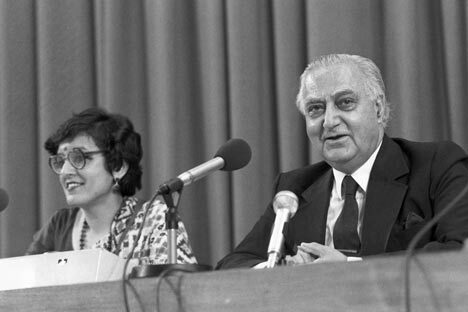 Kaul had two tenures as India’s ambassador to the former Soviet Union, in Moscow, during which he promoted Indo-Soviet traditional friendly relations to new heights. Kaul served as Indian ambassador to Moscow first during his active diplomatic service in the Indian Foreign Ministry in 1962-1966, at the height of the Cold War, and once again after his retirement in 1986-1989 - this time ambassador with a Cabinet rank. During both his stints in Moscow, Kaul did his best to assure the Soviet leadership that friendly relations between the two countries were of utmost importance in the prevailing geopolitical situations. Let me say at the outset that my meeting with Kaul was not just by chance, but arranged with a purpose. At the time, besides working as a senior Hindi translator and style editor, in the Progress Publishers, I was simultaneously doing reporting for an Indian newspaper as an Accredited Correspondent in Moscow. My work as a correspondent provided me an opportunity to be in touch with the head of Information Wing of the embassy. So was it with the-then Information Counsellor Veena Sikri, who one day called me to meet with her over a matter, connected with the holding of year-long Indian cultural festival in the Soviet Union and a reciprocal Soviet festival in India, in 1987. The two sides had decided to set up a press centre for the publicity and coordination of the festival events, for which she, purportedly under the instructions from Kaul, was looking for an Indian journalist to head the press centre. After getting my nod, Sikri took me to Kaul’s office and introduced me with him, explaining the whole thing. “Very good, young man for consenting” he said, with a smile on his face, which left on me an everlasting impression. He also told me that Veena will explain you what you have to do. When I told him that only difficulty was that I was working at the Progress Publishers to which he said : “Never mind, we will write a letter to the director requesting him not to give you urgent work.” Afterwards on several occasions, I found that Kaul had an uncanny knack of practically dealing with any problem during the organization of the festival. Kaul’s encouraging words to me with the smile of a famous but imposing Indian diplomat, sitting behind a table with a hefty personality, still echo in my ears. Such was his voice and emphatic style of speaking, occasionally roaring with confidence at all gatherings, including receptions, some of which I had the opportunity to attend during his second stint in Moscow. His resonant voice never lost tenor even when he very fondly shared a galore of anecdotes at cocktail receptions, dining table and public gatherings. Soon after when the festival press centre was set up at the Soviet Foreign Ministry’s Press Centre at the Zubovsky Boulevard, Kaul one day accompanied by Sikri dropped there just to see whether everything was all right. Later during my several meetings with him, in connection with my work, I noticed Kaul had a ruthless liking for minutest details related to a particular work to be done, in time. On the other hand, I also found that he always looked with compassionate sympathy to any genuine problems faced by his middle-and-junior-rank staff members, and also the people who approached for his help. Kaul’s outwardly bluntness was never deprived of the humane kindness and understanding. He was greatly concerned with the welfare and education of the lower echelons of the embassy staff and members of Indian community. Consequently, he decided to open a school under the embassy in Moscow. It was with Kaul’s initiative the Central School (Kendriya Vidyalaya) was opened in Moscow, in 1987. Today about 400 students receive education in the school from classes I to XII. Kaul took great interest in deepening and expanding Indo-Soviet friendly ties, with unabated optimism. He used to tell journalists it was the time the two countries took steps in the cultural field to go further from political and economic relations in order to establish people-to-people contacts, who will be the “real carrier of friendship” between the two countries, in the future.